A compiler is a computer program that translates instruction text into a different language of instruction text. The first language is called the source language, which is why instruction text is called source code. The second language, called the target, is usually for the computer to follow. In that case, the instructions become machine code. 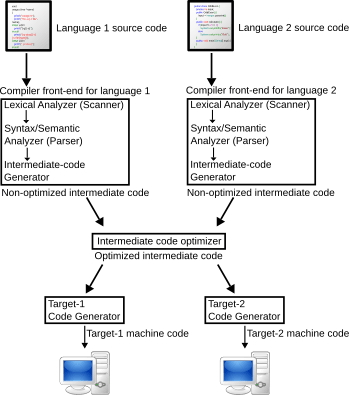 A compiler has six parts to turn source code into target code. The first piece, a lexical analyzer, will read a page of instruction text and split it into words and sentences. It also marks what kind of word it is. It might mark the word as a number, a word that might mean different things at diffent times (a variable), a verb, a math sign, or an adjective. In the end, it will get a long list of marked words called tokens. It hands the list to a parser. That piece will look at the way that the words flow in each sentence. It checks whether the sentences make sense in the source language. Then it checks whether the sentences flow okay. This is called semantic analysis. For example, the parser might complain about the lexed example above, if it hadn't already seen y with its type adjetive. The parser uses what it learned to make a web of all the text. The web structure is typically called an AST. The next piece, an optimizer will rearrange the web so the target language is better. 'Better' might mean the target text uses fewer instructions to do the same work. This could be important if we want the final program to check a lot of data. (Like seeing how many people, in the whole country, are fifty years old and buy medicine.) On the other hand, a 'better' result might mean turning long instructions into more small instructions. A programmer usually tries to write the instructions in small, related groups. That way, he or she can keep track of fewer changes in the program. But, that means the code may go on several pages. When a compiler sees that the target program uses several pages to explain the whole recipe, it may use a linker. The linker will put instructions that say where to find the code that's next. Finally, the compiler writes down the instructions in the target language. If the programmer made a mistake, like a misspelled word, the compiler will try to tell him or her what went wrong. But, since compilers are also programs, sometimes they were made with problems too. When that happens, it's hard to tell which is making trouble. So, programmers who make compilers try very hard to make them perfect. Compiler Facts for Kids. Kiddle Encyclopedia.